Even after linking up again with Adam, and despite the continued linearity of this section of the game, Fusion continues to allow you to feel like you’re basically free-wheeling. It manages to hit the same sweet spot that certain parts of Super Metroid did, giving you a nudge toward your objectives but leaving you to sort out exactly how you’re supposed to meet those objectives on your own. Zero Mission, as we’ll see, does this from start to finish, which is why Zero Mission is probably the best Metroid. The game also takes this opportunity to allow you to recalibrate yourself. You’ve been facing a host of ever-more-dangerous creatures, from the SA-X to Space Pirates that somehow transform into mermen, and for all your seeming progress Samus never really gets a leg up on the opposition. But as you return to the night sector, you work your way through areas you cleared much earlier in the game, fighting enemies who once demanded strategy and caution. 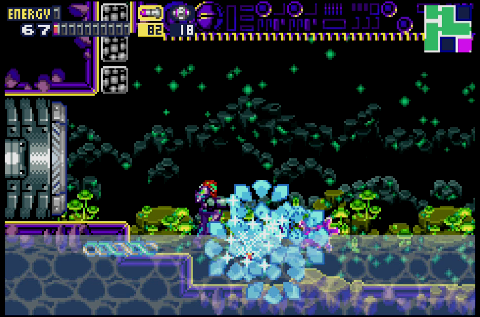 Now, equipped with a nearly full-powered beam, diffusion missiles, and the Gravity Suit, Samus slices through her enemies like a scythe through summer corn. You are mighty — it’s just that the enemies have scaled up with you. That said, you’re still not awesome enough to break through all those pinwheel wall barriers that seem to make up a significant chunk of the station’s core areas. Eventually, your path through puny weakling monsters leads Samus to a shuttered gate being watched by a video camera. 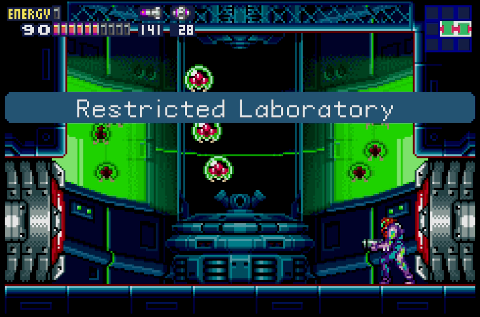 The camera is non-interactive and, unlike the mystery eyeballs at the beginning of Super Metroid, doesn’t follow Samus. Nevertheless, it definitely stands out here — and the fact that approaching the gate initiates a computerized voice warning you to stay out of the restricted zone definitely doesn’t sit right. However, you can’t get past this gate no matter how much you’d like to… so, naturally, the only solution is to go find a Core X with a Wave Beam power-up. That’s the routine in Biologic’s station: Hit a wall, kill a mutant alien virus, steal back a skill. Your goal now is a slightly flooded room, which you very likely passed through on your way to the locked gate — it’s much easier to find, more obviously in your path, and it sits suspiciously empty. Chances are pretty good you would have stumbled upon it before triggering the warning voice and, in an attempt to make sense of what this pointless room was about, detonated a Power Bomb that revealed ladder rungs running across the ceiling. Those rungs turn out to be of vital importance once you’ve triggered the alert, since the computer warning draws the security robot out of hiding. Alas, some idiot at Biologic decided to make B.O.X. with organic components, and it’s now corrupted by the X as well as everything else on the station. The robot has a fairly simple pattern here, but it’s devastating. It scuttles along the floor, leaping frequently with the intent of body-checking Samus, which jars her loose from the rungs. It also fires off strings of missiles, several at a time, which rise up before homing in on Samus. These, too, dislodge Samus on contact. That’s bad, because the robot has electrified the pool of water — touching it saps Samus’ energy quickly, and with the boss constantly slamming into you, it can be tough to get back out again. You’d think this would be a great place to make use of your Diffusion Missiles; since it’s tough to draw a bead on the robot and it’s constantly firing off projectiles, the diffusion effect should allow you to “fire and forget,” right? The wave taking out the enemy missiles and delivering damage to its vulnerable core. Sadly, that’s not how this fight works. The missiles are unaffected by diffusion, and you have to hit the biological core directly in order to effect damage. …and make the most of rare and precious openings. The B.O.X. doesn’t take a huge number of hits to defeat, but actually landing those blows can be ridiculously difficult. There is one saving grace to this battle, though: B.O.X. is not very smart, and there’s a safe spot in this room. Despite its ability to jump, the boss’ pattern doesn’t allow it to hop up on the raised perimeter of the room. So, if you hang above the lip of the floor at the right or left edge of the space, you’ll be completely safe from B.O.X.’s dangerous leap attacks. You’ll also have plenty of lead time to shoot down its missiles as it paces back and forth. And, every once in a while, it’ll come into your line of sight. It’s not a courageous approach, but this sort of exploit is fairly uncommon in Fusion. Might as well take advantage of it, yeah? Well. A thing like that. The Wave Beam acquisition was basically a given at this point, but it does feel a little unsatisfying from a design sense: Pretty much every boss until now has made use of the ability its Core-X stole from Samus, but nothing about B.O.X. resembled the Wave Beam (which allows your arm cannon fire to pass through all barriers in addition to the Plasma effect that pieces foes). While you had to gain the Wave Beam in order to advance, and you were bound to face off against B.O.X. again, it feels a bit obligatory rather than inspired. Anyway, the Wave Beam allows Samus to bypass the security gate and ender the restricted zone. The closest I can think of to a link between the wall-piercing Wave Beam and B.O.X. is that, when B.O.X. went haywire, it would crash through walls and ceilings. I think there’s a link, but it doesn’t have much to do with the wall-piercing aspect of the wave beam. The wave beam is energy—electrical energy. This is why it can travel through walls and objects where plasma and the other weapons cannot: those are projectile weapons, but the wave beam is pure energy. (Because we all know that electrical energy passes right through walls in video game logic.) The B.O.X. is a security robot with some biological parts, because how could *that* ever go wrong, and it’s so full of energy that while you fight it, it electrifies the water. Electric water = energy = wave beam. Get it?